There is a team of four men here from BC to install the commercial kitchen in the Tech school. This kitchen was donated by Red Deer College and came down here in a container. 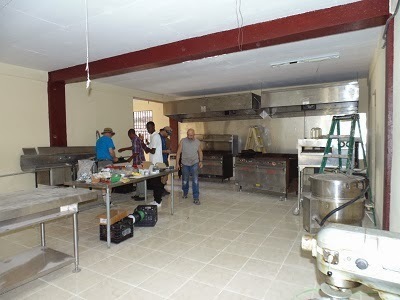 With this kitchen, the school will be able to run a cafeteria and hold cooking classes. Thanks to Jim, Mike, Ralph and Bryan for giving a week of their time and expertise to do this for us. Will you be giving cooking classes, Marilyn?! It looks like it is going to be a real professional operation. Terry C.